This book focuses on social and cultural trends in present-day Hadrami Arab societies in Eastern and Central Indonesia, and the history of the Hadrami Arab people, which demonstrates an early form of globalization. For centuries migration has played a vital part in Hadrami adaptation. External forces, such as the expanding powers of the Portugese in the Indian Ocean and the Turkish conquering Yemen, and internal forces like poverty, droughts and political unrest as well as trading opportunities and missionary work instigated migration movements. While some Hadrami Arabs sought work in North America and Europe, other waves of Hadrami migration have followed the monsoon winds of the Indian Ocean to the Zanzibar coast, India, Malaysia and Indonesia. The story of Hadramis in Indonesia has largely been a story of success, in terms of trade, politics, education and religious activities. 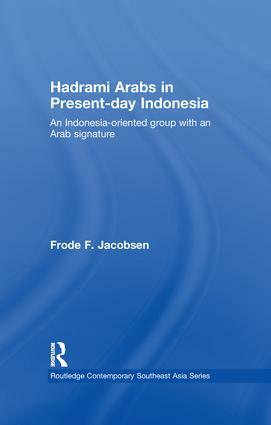 Despite continual debate regarding what constitutes Indonesian Hadrami identity, the author argues that they are still "an Indonesia-oriented group with an Arab signature". This book will be of interest to Southeast Asian and Middle East specialists and scholars in Anthropology and Migration Studies.